Home sellers and buyers usually face a number of uncertainties during the selling and buying processes. True market values of properti​​es are always in question, as is the relative strength of supply and demand in local real estate markets in any period, sellers' information about the properties versus buyers' information, and many other issues. These uncertainties stem from the fact that each property is unique because of location, structure, age, design, and a host of other details. Housing markets are always in a state of flux. While sellers seek maximum selling prices and minimum days-on-market, buyers seek minimum prices and minimum search costs in terms of money and time. 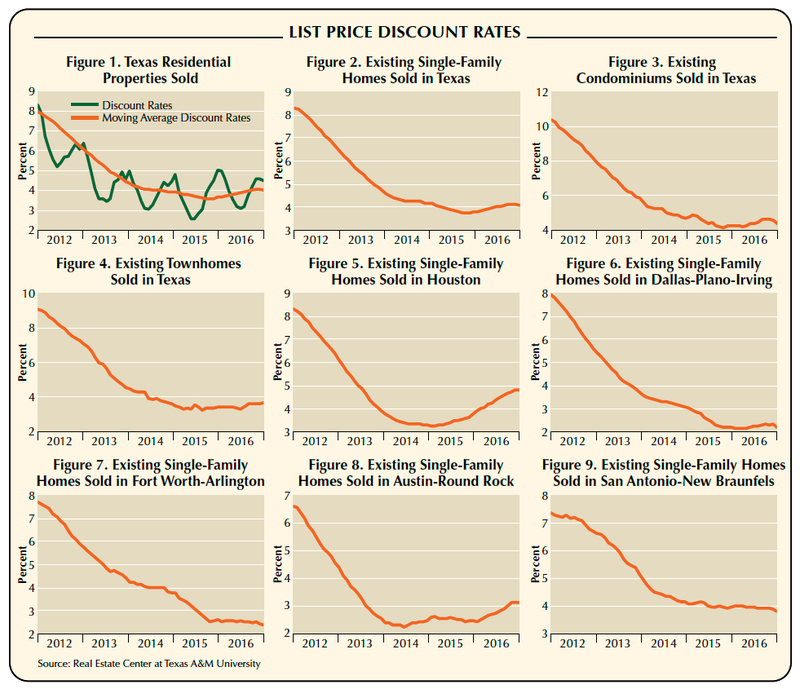 Center researchers found that the time series of list price discounts of homes sold in Texas is an important indicator of general market conditions and the market liquidity of homes sold in local housing markets. They also found that discounts to list prices in Texas residential markets trended downward after the state's economy recovered from the Great Recession, but the downward trend has slowed recently and in some markets even reversed. Because of price uncertainty, one selling strategy commonly practiced in U.S. real estate markets is to choose a list price higher than the average prices of comparable properties in local markets to leave "room for negotiations." This is followed by a wait-and-see process testing the strength of demand by measuring the traffic of viewers to for-sale properties. 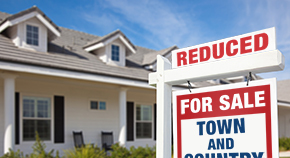 Depending on the amount of traffic, the seller may revise the list price upward or downward. If there are no offers, listing prices typically are lowered by offering discounts to listing prices or accepting offers below list prices. Conversely, in tight, strong-demand periods, buyers may offer more than the list price to obtain the property. Deciding on the discount is difficult. The seller may want to offer a discount to attract buyers but at the same time wants to get the maximum price for the property. Sellers' agents know local market conditions and can help the seller balance the need to get the best price with the need to reduce selling time. List price asked by sellers is the counterpart of asking price in the stock market, while a price offer is similar to a bid price in the stock market. The bid-ask spread for a particular stock is the difference between bid and ask, and is a measure of the relative strength of the supply and demand for the stock as well as liquidity of the stock. 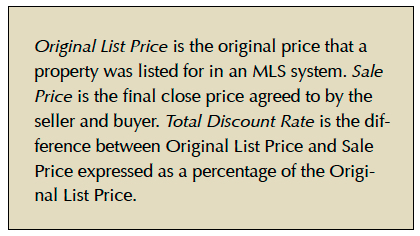 Discounts to list prices in real estate markets are similar. Smaller (larger) discounts mean more (less) liquidity, higher (lower) demand relative to supply, and stronger (weaker) sellers' bargaining power. Total discount rates are computed from list and sale prices and can be expressed in terms of the ratios of 1) original list price to sale price, 2) sale price to original list price, 3) difference between original list price and sale price, or 4) difference between sale and original list price divided by list price. Average total discount rates for real estate properties in local markets are computed as the difference between average list price and average sale price divided by the average list price. Discount rates can be computed for all properties sold in regional markets and are commonly computed for residential, commercial, and industrial markets. Time series of the average list price discount rates in local real estate markets offer information about the strength of supply and demand conditions. Increasing (decreasing) average discount rates indicate increasing (decreasing) supplies of properties relative to demand. These conditions are known as buyers' markets when the list price discount rates are increasing and sellers' markets when the discount rate declines. Prospective sellers and buyers can look at the trends in average list price discount rates to better understand local market conditions, which are useful when selling or buying properties. Data used are monthly time series of average total discount rates for residential properties sold in Texas markets from January 2011 to December 2016 for three markets of single-family homes, townhomes, and condominiums (see sidebar). Time series of discount rates are computed by dividing the difference between the average list price and average sale prices by average list price in a region (state, metropolitan, county) in a month and expressed as percentages. The resulting time series of discount rates monitor the relative strengths of the supply and demand sides of the state's housing markets and the liquidity of residential properties in any given period. Time series of list price discount rates for all types of residential properties (single-family, townhomes, condos) since 2011 is shown in Figure 1. The rates display seasonal variations with peaks in winter and troughs in summer. 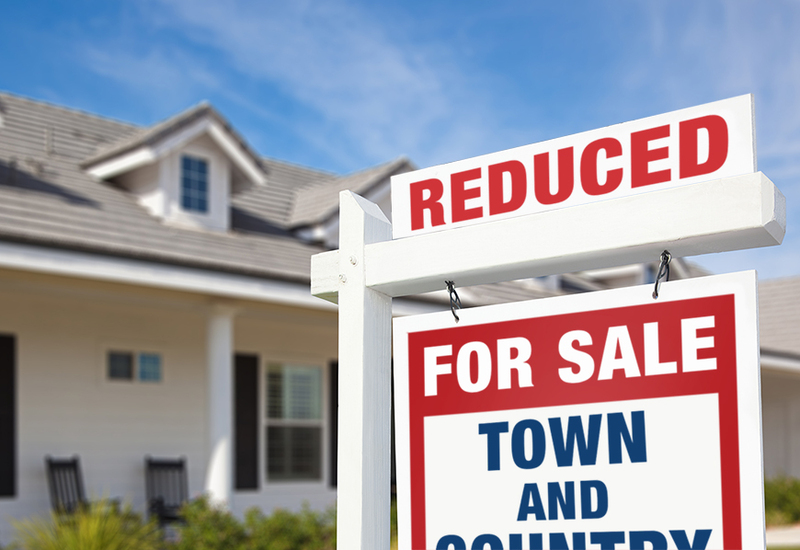 Sellers in winter need to offer larger discounts to list prices to sell residential properties when demand is weaker. Figure 1 also shows the 12-month moving averages of discount rates to adjust for seasonal variations and displays the trend in the time series. The moving average shows a downward trend in the rates after the Texas economy recovered from the Great Recession. The rate fell from 8 percent in January 2012 to 3.6 in October 2015 and increased to 4 percent in December 2016. The falling rates suggest the growing strength of demand for residential properties and increasing liquidity of homes sold in Texas housing markets, leading home sellers to offer lower list price discounts. On the demand side of the housing market, the most important factors contributing to lower discount rates were more jobs, growing incomes, and lower mortgage rates. On the supply side, the shrinking inventories of foreclosed homes left over from the Great Recession contributed to smaller supplies of for-sale homes. The moving averages of discount rates to existing single-family homes sold in Texas fell from 8.3 percent in January 2012 to 3.7 percent in October 2015 (Figure 2). The downward trend was steep in 2012–13 but slowed since mid-2014. The moving average rates have increased to 4.1 percent in December 2016, indicating the end of the downward trend. Sellers of existing condos had to offer discount rates of 10.4 percent in January 2012 to market condos (Figure 3). The rate trended downward, falling to 4.1 percent in October 2015 and since then has trended upward to 4.4 percent in December 2016, suggesting a mild cooling of the state's condo markets in late 2016 and the end of falling discount rates. The moving averages of discount rates to existing townhomes sold in Texas have fallen from 9 percent in January 2012 to 3.3 percent in August 2015 and since then have increased to 3.7 percent in December 2016, indicating the end of falling rates that began after the state's economy recovered from the Great Recession (Figure 4). All five major Texas metropolitan areas experienced downward trends in average list price discount rates for single-family homes sold from January 2012 to September 2016. However, the initial rates in January 2012 and the latest rates in December 2016 vary significantly across the metro areas (Figures 5 to 9). Houston-The Woodlands-Sugar Land had the largest list price discount rate for single-family homes in January 2012 followed by Dallas-Plano-Irving, Fort Worth-Arlington, San Antonio-New Braunfels, and Austin-Round Rock (see table). The Houston discount rate fell steeply from 8.3 percent in January 2012 to 3.8 percent in January 2014, then reached a trough of 3.2 percent in February 2015 (Figure 5). But the collapse of oil prices in 2014 led to losses in jobs and incomes that were reflected in growing list price discount rates. Since February 2015, Houston home sellers have increased the discount rates, reaching 4.8 percent in December 2016 (Figure 5). While the Houston metro area suffered from the oil price collapse, Dallas' economy continued to expand after the Great Recession, mainly due to its strong link to the U.S. economy. The impacts of the flourishing Dallas economy are reflected in the downward trend in discount rates. Dallas-Plano-Irving fell from 7.9 percent in January 2012 to 2.2 percent in December 2016, the lowest discount rate among the major state's metro areas (see table and Figure 6). The discount rates in Fort Worth-Arlington's single-family housing market fell from 7.7 percent in January 2012 to 2.4 percent in December 2016, the second lowest rate among the state's major metro areas (see table and Figure 7). The similarity of the area's trend in discount rate with that of Dallas and its most recent low discount rates suggest that the expansion of the U.S. and Dallas economies may have positively impacted Fort Worth's economy. Austin-Round Rock had the lowest list price discount rate in January 2012 at 6.6 percent (see table and Figure 8). The metro area's discount rate fell to 2.2 percent in June 2014 but has since trended upward, reaching 3.1 percent in December 2016, suggesting a mild cooling off of the metro area's single-family housing market (see table and Figure 8). Dr. Anari (m-anari@tamu.edu) is a research economist and Klassen (gklassen@mays.tamu.edu) is a research data scientist with the Real Estate Center at Texas A&M University.